What is the KBIT Test? How is the KBIT Test Scored? Wondering what kinds of questions your child will be asked on the KBIT-2 Test? Here are five examples below. For additional practice with these style questions, check out our 100 free practice questions. IMPORTANT: While the KBIT-2 sample questions shown on this page are representative of what your child will see on the exam, they aren’t taken directly from the actual test that’s being administered this year. Look at the shapes in the boxes on top. Do you see how they are related to each other? 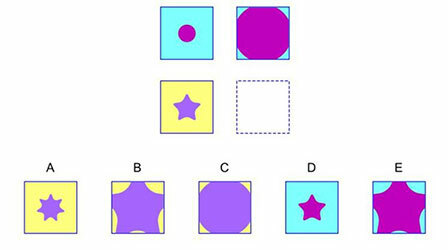 Can you find the answer that goes in the empty box so the shapes in the bottom row will relate to each other in the same way as the shapes in the top row? Do you see these 4 boxes? In the top row the pictures go together in a certain way. Now look at the bottom row. Do you see the empty box? Which of the 4 pictures on the side goes with the picture in the bottom box the same way the 2 pictures in the top row go together? Touch the picture of the thing that is the lightest. For the next question, look at the phrase and the underlined word. 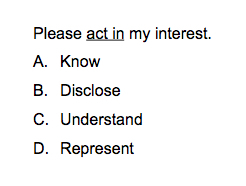 Then mark the word in the list below that has practically the same meaning as the underlined word. Jake was really hungry. He ordered a pizza with 16 slices. He was only able to eat 4. What fraction of the pizza is left? Kaufman Brief Intelligence Test™, Second Edition™ (KBIT-2™) is a trademark of Pearson Education, Inc or its affiliate(s), or their licensors. TestingMom.com is not affiliated with nor related to Pearson Education, Inc or its affiliates (“Pearson”). Pearson does not sponsor or endorse any TestingMom.com product, nor have TestingMom.com products or services been reviewed, certified, or approved by Pearson. Trademarks referring to specific test providers are used by TestingMom.com for nominative purposes only and such trademarks are solely the property of their respective owners.